Your day-by-day itinerary now includes Yarra River, Brighton Beach and University of Melbourne. To find maps, traveler tips, and tourist information, you can read our Melbourne online visit planner . Singapore, Singapore to Melbourne is an approximately 10.5-hour flight. You can also do a combination of flight and shuttle. Traveling from Singapore to Melbourne, you'll lose 2 hours due to the time zone difference. Traveling from Singapore in July, expect Melbourne to be cooler, temps between 15°C and 6°C. You will have some time to spend on the 27th (Sat) before leaving for Hobart. You've added Sullivans Cove, Salamanca Market, Constitution Dock, and other attractions to your itinerary. 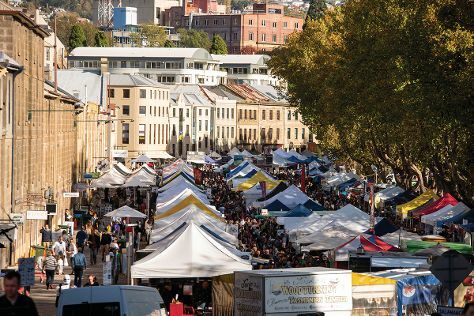 On the 27th (Sat), shop like a local with Salamanca Market, take in the waterfront at Constitution Dock, then wander the streets of Sullivans Cove, and finally take some stellar pictures from Mount Nelson Lookout. To see where to stay, photos, traveler tips, and more tourist information, you can read our Hobart driving holiday site . Traveling by flight from Melbourne to Hobart takes 4 hours. Alternatively, you can do a combination of ferry and car; or do a combination of ferry and bus. July in Hobart sees daily highs of 15°C and lows of 4°C at night. You will have some time to spend on the 28th (Sun) before leaving for Richmond. To see ratings, traveler tips, photos, and more tourist information, read our Melbourne trip planner . Traveling by flight from Hobart to Melbourne takes 4 hours. Alternatively, you can do a combination of car and ferry; or do a combination of bus and ferry. You will leave for home on the 2nd (Fri).